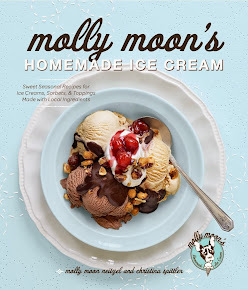 molly moon's homemade blog: molly moon's is turning five! molly moon's is turning five! way back in 2008 molly had the simple vision of creating a community gathering place that served up fresh and delicious ice cream. there would be a handful of scoopers and, with any luck and a lot of hard work, a small but loyal fan base. we dreamed of creating daring new flavors and living the good life in our little wallingford shop. 5 years, three new shops, and even a cookbook later, we are indeed living the good life as we get to spend our days meeting wonderful people and doing our best to create wonderful new flavors. a huge thank you to anyone who has ever come into a molly moon's for a cup or a cone. you all have made this an incredible 5 years and we can't wait to see what happens in the next 5.
come celebrate the 5 years with us and try our birthday neopolitan sundae, because what's a birthday without a little cake? Please install a compost can in front of your stores.the Wallingford location is often strewn with litter after the city trash can is full.disgraceful. We love the blog! And we love ice-cream.